Before getting into Housing Purchase Applications, let's discuss the recent Fed minutes. Fed did its job early this year by becoming move dovish in the face of weak economic reports. Current policy is in the sweet spot where inflation won’t spike and the economy probably will avoid a recession. Fed is back to auto pilot in the sense that if it doesn’t make any changes in the next 6 months, the slowdown should end. Also, the stock market shouldn’t crater, and core inflation should stay around 2%. Late last year, Powell made the mistake of saying the balance sheet unwind was on auto pilot just as economic growth was slowing. This mistake catalyzed the 20% decline in the S&P 500. Of course, that wasn’t the only catalyst of the mini-bear market, but it was important. In the near term, the risks to the economy are to the downside. And in the medium term the risks are to the upside as inflation should increase. In Fed speak, the Fed is explaining why it won’t raise rates, but according to markets, there is a much greater chance of a cut this year, than a hike. In fact, the CME Group FedWatch tool states there is a 53.1% chance the Fed cuts rates in 2019 and a 0% chance the Fed hikes rates. Because the economy generally moves slowly, I can’t see any scenario where the Fed hikes rates in the next 6 months. Investors continue to think the Fed won’t cut rates either. However, it's easy to envision a scenario where the market prices in a very high chance of a cut (above 70%) if the slowdown gets worse before it gets better. One BLS report where job growth is negative could push markets towards expecting a rate cut. Low jobless claims make that unlikely to occur in April, but it could occur this summer if economic growth falters. It’s easy for most traders to see the Fed’s impact on markets, but sometimes the Fed isn’t clear on how its actions affect stocks. The Fed didn’t explicitly want to raise the S&P 500, but the stock market is an important part of the economy and financial conditions. The housing market isn’t exactly on fire, but it is doing better than last year which is a great sign for Q2 GDP growth. ECRI leading index isn’t a perfect predictor of GDP growth. Housing market can drive growth higher despite cyclical headwinds from manufacturing. If the MBA applications reports from this spring selling season are accurate, future housing market stats will improve as well. It’s not a shock to see housing improve since mortgage rates have plummeted. 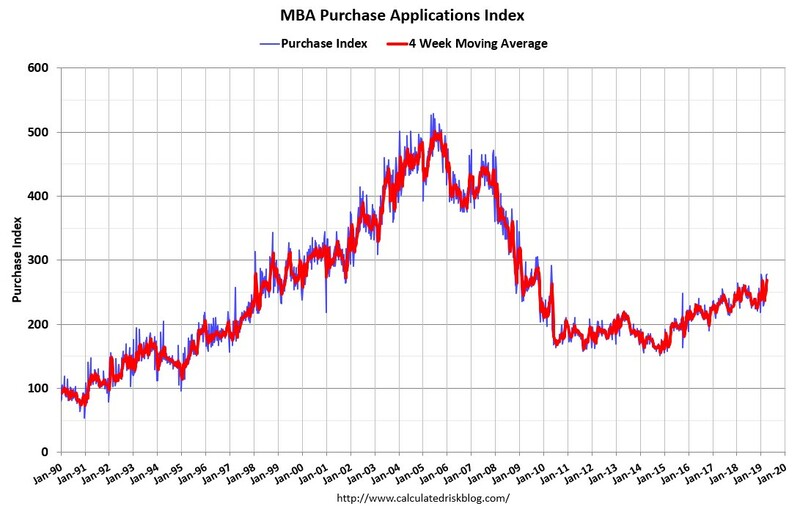 In the week of April 5th, the MBA applications index declined because refinancing fell. Refinancing had spiked in the previous 2 weeks because of the crash in mortgage rates. Specifically, the overall applications index had -5.6% weekly growth which was on top of 18.6% growth. Refinance index fell 11% after rising 39%. Obviously, 39% growth is impossible to maintain. The good news is the purchase index was up 1% weekly which was on top of 3% growth. That weekly growth doesn’t seem like a lot, but it is because growth has been mostly positive in the past few weeks. It’s better to see steady positive growth than some readings of high growth and some weeks with negative growth. Yearly purchase applications index was up 13% yearly. As you can see from the chart below, the 4 week average has been in a solid uptrend since 2015, but last year was weak. 13% yearly growth tied the highest growth rate all year. But it’s more important now because we are in the spring selling season. There have been 10 positive yearly growth prints and only 3 negative prints this year. Improved housing market could end the streak of negative real residential investment growth that existed every quarter last year. Fed has been able to maintain rates because inflation has been tepid since the end of 2018. The Fed likes to focus on core inflation. But if headline inflation ramps the Fed still will be pressured to hike rates. April’s headline inflation will probably be above core inflation because of rising energy prices. As you can see from the chart below, the national average price of gas has increased 57 straight days. 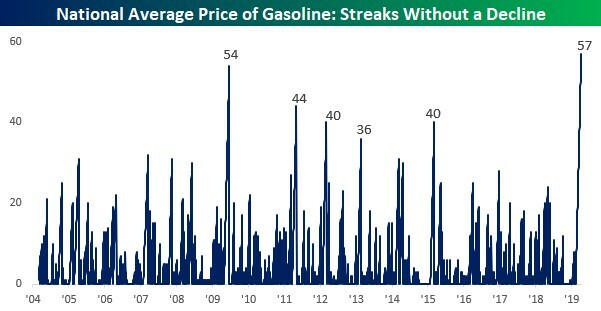 That’s the longest streak on record. This doesn’t mean the size of the increase has been the largest ever, but there is something to be said about prices rising steadily just like how MBA purchase applications have increased steadily. Fed said it won’t hike rates this year in its Minutes. It will be interesting if the economy weakens further and inflation rises in the next few months. Stocks are clearly focused on 2020 as that’s when the slowdown might end. Rising energy prices and rising wages will hurt margins. That’s partially why revenue growth will be positive in Q1, but earnings growth, according to FactSet’s numbers, will be negative. Rising gas prices could make a rate cut less likely. I think the Fed will restart its rate hikes in 2020. The Fed likely avoided a recession this year by pausing rate hikes.